Jesus | Barry R. Leventhal, Ph.D. 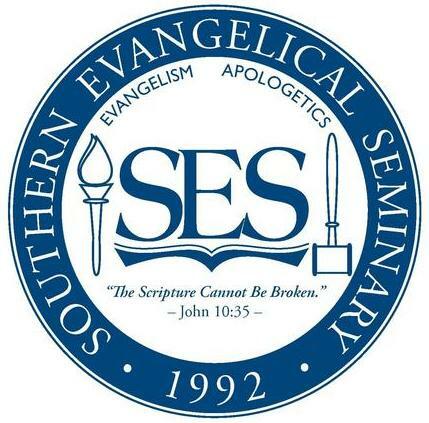 The aim of apologetics, like everything else, ultimately is to glorify God.29 As the Westminster Shorter Catechism rightly affirms: “Man’s chief end is to glorify God and enjoy Him forever.” God is committed to our task: When we fully depend on Him and prayerfully seek to dismantle the wall that is buttressed by the evil of the Holocaust and the dissonance of doubt, God will work in and through us with the Jewish people – to His glory. After all is said and done, including our allowance for the place of divine mystery (Deuteronomy 29:29), Isaiah’s confession concerning the Jewish people is still true: In all their affliction He was afflicted, and the angel of His presence saved them; in His love and in His mercy He redeemed them, and He lifted them and carried them all the days of old (Isaiah 63:9). For the follower of the Lord Yeshua, one goal remains preeminent: fighting our way into the eye of the storm and staying there. The eye of the storm is that calm center of a devastating storm. One thing is for sure: We don’t want to be caught in a tornado, a hurricane, a cyclone, or a blizzard. No, rather we are looking for and fighting our way into that peaceful center where God Himself dwells. “Be still and see the salvation of the Lord, which He will accomplish for you today” (Exod. 14:13; 2 Chron. 20:17). “Surely I have composed and quieted my soul” (Ps. 131:2). “For thus the Lord God, the Holy One of Israel, has said, ‘In repentance and rest you shall be saved, in quietness and trust is your strength'” (Isa. 30:15). “And the work of righteousness will be peace, and the service of righteousness, quietness and confidence forever” (Isa. 32:17). So there you have it. God makes it abundantly clear. Find the eye of the storm: “Be still!” “Quiet your soul.” “Rest.” “Quietness.” “Peace.” “Confidence.” So where do we find this eye of the storm? How about finding it in the Lord Yeshua Himself, “Come to Me, all who are weary and heavy-laden, and I will give you rest. Take My yoke upon you and learn from Me, for I am gentle and humble in heart, and you will find rest for your souls. For My yoke is easy and My burden is light” (Matt. 11:28-30). With an invitation like that, who wouldn’t want to come to Him, take upon His yoke, and learn from Him? Boy, I could use some of His rest, right now! How about you? But it is not always so easy. Why? Too many storms blowing all around us: stormy problems, stormy relationships, stormy jobs, stormy leaders, stormy churches, stormy cultures, stormy [you fill in the blank . . .]. 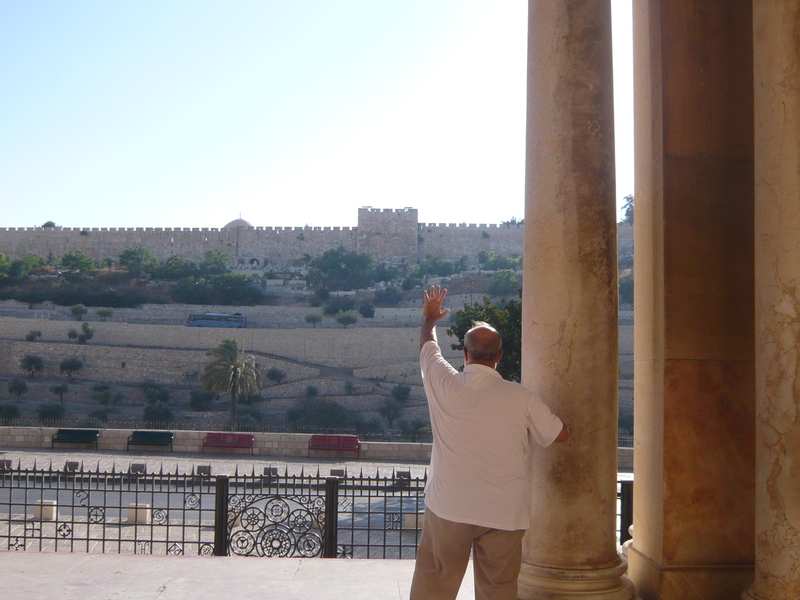 Let me suggest a few ways that Phillip and I have discovered here in Israel, ways of breaking through into the eye of the storm. First, find “a quiet place,” for a quiet time. It won’t be easy. There’s just too much noise all around us. 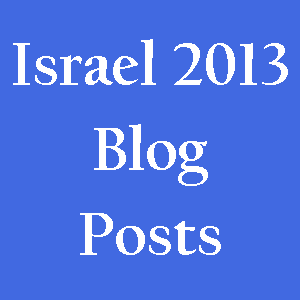 Mary says there are actually five languages here in Israel: Hebrew, English, Arabic, Russian, and “Honka-Da-Horn”! 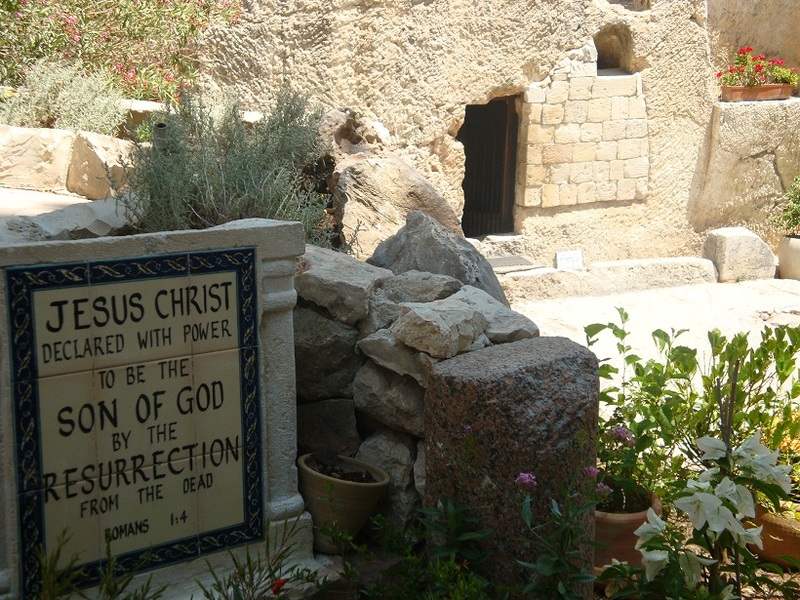 So we may have to fight through to some quiet place like The Garden Tomb, the Protestant sight for our Lord’s crucifixion, burial, and resurrection. It not just a garden. It’s His garden. And it’s quiet! The Quiet Place at Last! Second, find “some quiet people.” This isn’t so easy. Everybody seems too busy and too noisy. 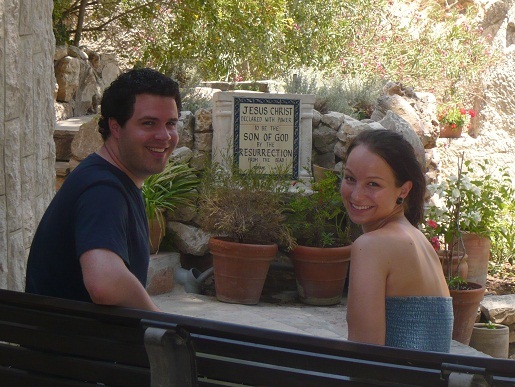 But maybe in your quiet place you can discover some quiet people, like a beautiful young couple from Norway that we met at The Garden Tomb. You never know who you might meet in a quiet place. And third, find “the Quiet Person.” This is easy. For He is the very One who invited us to come to Him in worship in the first place! You guessed it. The Lord Yeshua is always waiting for us to invite Him into our stormy worlds. Peter and the first disciples had to learn this lesson and so do we (see Matt. 14:22-33). And that’s where Phillip and I met Him once again in worship: with some new friends from Michigan who invited us to join them in the Lord’s Supper. Where? 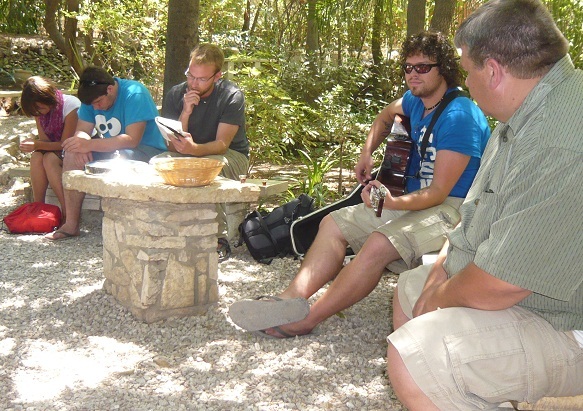 In The Garden Tomb on the same day we met our Norwegian friends! So remember, the eye of the storm is a Person, in a place, with other storm-driven persons. The Golden Gate: Who Really Rules? We rule! The Moslem ruler Abdul Malik Ibn-Marwin built the famous dome in 691. 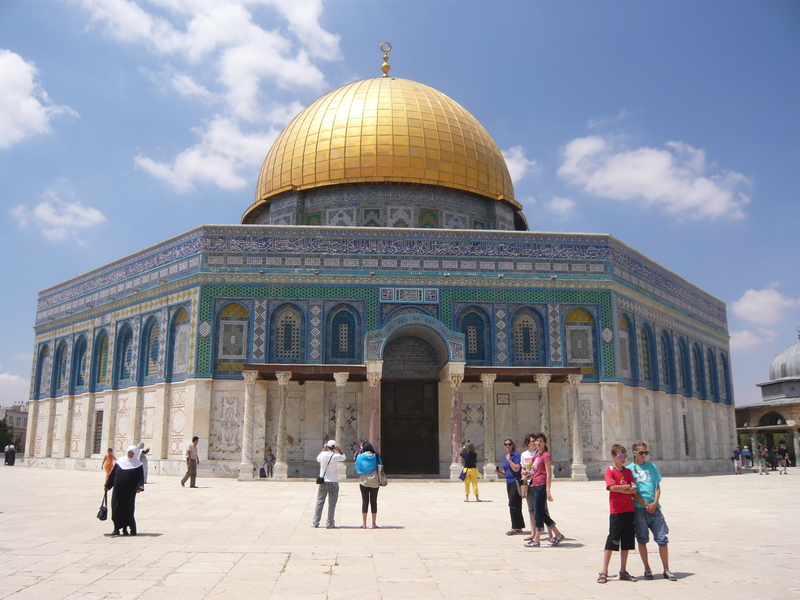 Now it is called the Haram esh-Sharif, “the Noble Enclosure.” And today, no matter the identity: The Palestinian Authority (the PA), The Palestine Liberation Organization (the PLO), Hamas, Hizballah, an Intifada (Uprising), a Jihad, etc., the claim still stands: We rule! One ancient Islamic tradition illustrates this claim to total rulership. 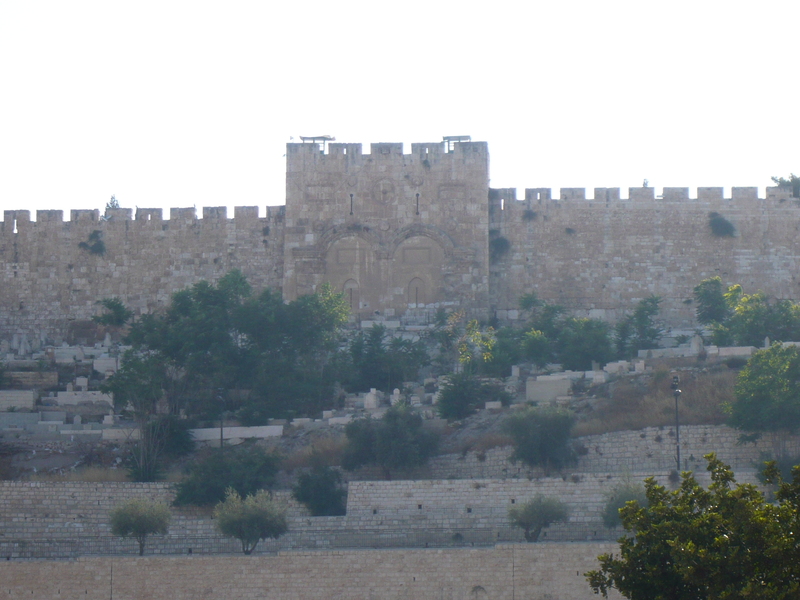 The current wall that stands around Jerusalem was built by Suleiman II the Magnificent in 1535-1542 (a rather humble ruler). Boy, are they in for a surprise! 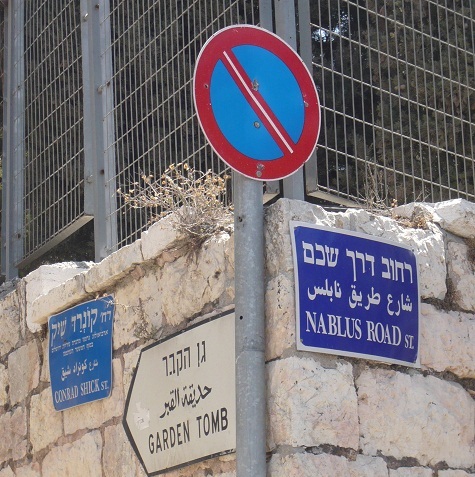 When the Lord Yeshua comes, claiming His rightful, messianic rule, no sealed or walled up gate will be able to hold Him back. When He comes this second time, it will not be on a donkey and its colt. No, this time He will come riding triumphantly on a white horse, carrying the identity: “Faithful and True, and in righteousness He judges and wages war” (Rev. 19:11). So much for the petty rulers down through history! And one more thing, we’ll be coming with Him: “And the armies which are in heaven, clothed in fine linen, white and clean, were following Him on white horses” (Rev. 19:14; cf. Zech. 14:5b; Jude 14-15)! “He who testifies to these things says, ‘Yes, I am coming quickly.’ Amen. Come Lord Yeshua” (Rev. 22:20; cf. 22:7, 12; also “Maranatha”: “Our Lord, come!” in 1 Cor. 16:22). Bring it on Lord Yeshua! It's Your Rule!